Only six numbers on this CD, but quality not quantity! This brings a tingle to the back of your neck as the two girls’ harmonies kick in, it seems as though their voices were made to blend together, producing that authentic country s ound on a couple of Carter Family numbers, “Are you tired of me my darling?” and “When the roses come again”, the Osbornes’ “Give this message to your heart”, Ola Belle Reed’s “High on the mountain” , “I’ll fly away” which features in the film “Oh Brother, where art thou?” and a new composition by Rosie herself especially for this CD, “The Lily and the Rose”. 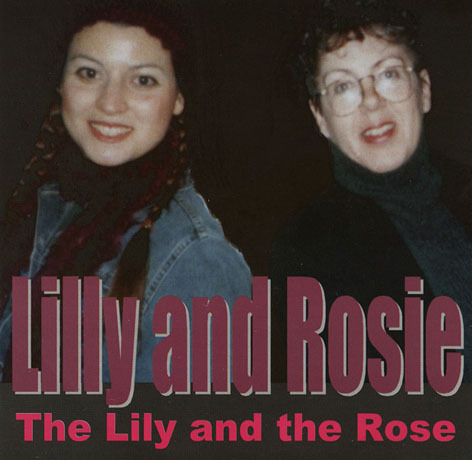 Lilly plays guitar, Rosie autoharp and they are backed by the legendary Rick Townend on mandolin, fiddle and banjo. Rick also supplies some of the harmony vocals. Rosie and Rick of course played together for years and are stalwarts of the UK acoustic country scene, but on this CD they were joined by Lilly Drumeva, originally from Bulgaria, whose band “Lilly of the West” won the European World of Bluegrass competition in 1997 and showcased at the International Bluegrass Music Awards in Kentucky in 1998 - so the pedigree is excellent and the resulting combination of talents is electrifying. Click here to pay in UK £. EUROS or US DOLLARS via the PAYPAL SECURE PAYMENT SYSTEM which accepts all major credit cards.